A tincture is a method of extracting the healing properties of herbs into a combination of water and alcohol (or vinegar). Alcohol-based tinctures last a very long time, and extract and concentrate a maximum of the medicinal chemicals in the herbs you have chosen. 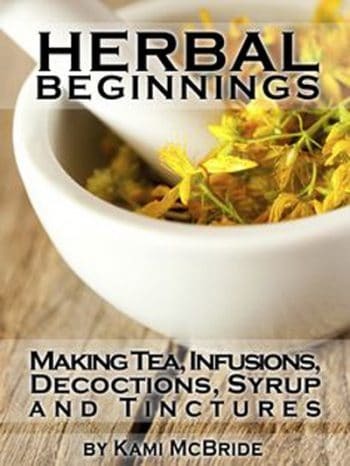 According to the delightful little book, Herbal Beginnings – Making Tea, Infusions, Decoctions, Syrup and Tincture by Kami McBride, there are a couple of ways to make tinctures. The combination of ingredients used to extract the herbs (in this case a combination of alcohol and water) is called the menstrum. Tinctures made with fresh herbs are prepared using one part fresh plant by weight (using a scale) to two parts menstrum by volume (using a measuring cup). This is written on the tincture bottle as 1:2, which means that there is one part herb by weight to two parts menstrum by volume. Tinctures made with dried herbs are usually prepared with one part dried plant by weight and five parts menstrum by volume. This is written on the bottle as 1:5. Often people do not have a scale to make tinctures by weighing out the herbs. For this reason, Herbal Beginnings gives detailed instructions for the “home method” of tincture making using any herb you choose. It is simple and gives you good medicine. The following recipe is an example of the “home method” of tincture-making. Fennel (Foeniculum vulgare) is a perennial herb belonging to the parsley (Umbelliferae) family, a broad family of herbs that also includes caraway, dill, anise, and cumin. The seeds are used as a spice and have a sweet taste that is similar to anise or licorice. 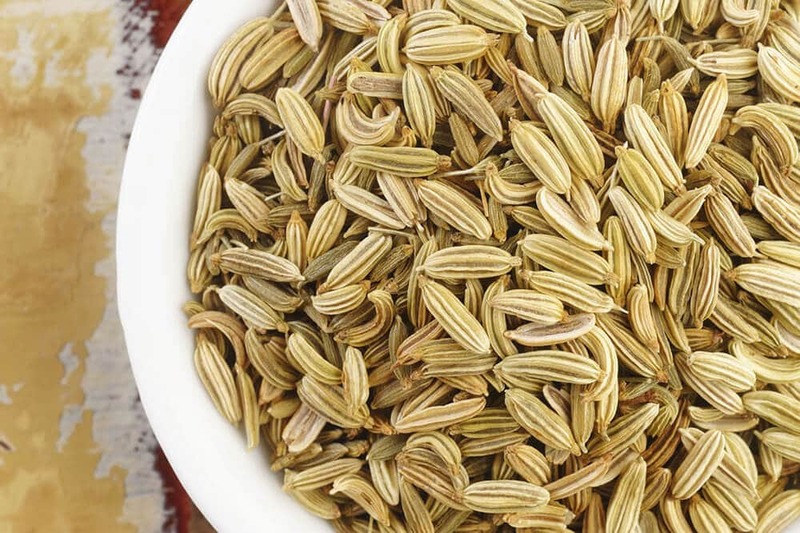 Fennel seeds function as a carminative—an herb that helps expel gas from your intestines. Scientific studies on fennel seeds show that their essential oils are both anti-spasmodic and anti-inflammatory, and can relax the intestinal muscles that keep gas stuck. The oils in fennel seeds are also thought to stimulate bile from the gall bladder, which can prevent digestive issues from occurring in the first place. Fennel seed tea (a cup of hot water poured over a teaspoon of crushed seeds), or chewing half a teaspoon of the fresh seeds, is a simple way to prevent or alleviate many digestive problems like gas, bloating and cramps. Diluted fennel seed tea is even recommended as a remedy for colic in babies. Eating fennel seeds, fennel seed tea or fennel seed tincture has also proven effective for many people with more serious digestive disorders like IBS. 15 drops of this fennel seed tincture in a little warm water does wonders for indigestion, bloating and a stomach ache from poor food combining. The warm water will also help the alcohol in the tincture to evaporate before consumption. This recipe for fennel seed tincture is from Herbal Beginnings, and will help with many digestive problems like gas, bloating, cramps and even colic. Mash the fennel seeds up in a mortar and pestle. Put the fennel seeds into a clean, half-pint, glass canning jar. Pour vodka or Everclear over the top of the seeds. Fill the jar to the top with vodka and close the lid loosely. After a couple of days check your tincture and see if you need to top the jar off with more alcohol. Let the herbs infuse into the alcohol in a cool dark place for one month and then strain out and discard herbs. Store the fennel tincture in a dark bottle in a cabinet. Excerpted with permission from Herbal Beginnings – Making Tea, Infusions, Decoctions, Syrup and Tincture by Kami McBride.